Typically I’m not a big fan of the sim-management type games. Back in the day I was hopelessly addicted to SimCity on the SNES, but future iterations of that game and of similar franchises just never appealed to me. They all seemed a bit too complicated, or required a hectic style of time and resource managing that turned me off to them, and nothing has quite captured the particular mix of simplicity and subtle depth from that classic SNES title. 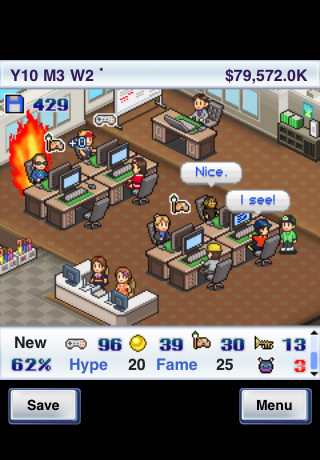 That changed yesterday when I discovered Kairosoft‘s Game Dev Story [$3.99] on my iPhone. It offers a sim-management experience that’s not overwhelmingly complex, but at the same time has a lot of different elements that meld together well to create compelling gameplay. Plus, it’s just a ton of fun to create your own games and see them go on to be huge successes (and sometimes total flops). 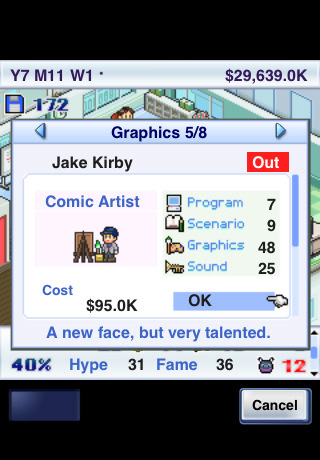 In Game Dev Story you’ll play the president of a fledgling game development company as you direct your crew of designers, artists, and coders in an effort to create a string of successful video games over a 20 year time period. 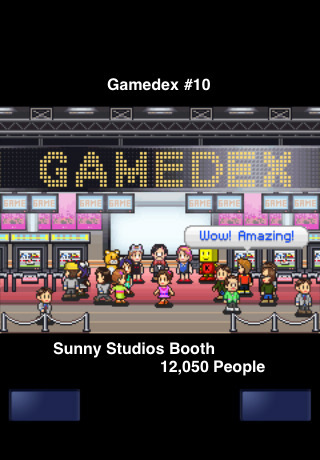 Beyond just making games, you’ll need to grow your own brand name by running a game convention booth, attending awards shows, advertising, and managing an ever-changing fan base. As your company expands, you’ll have the opportunity to move into larger offices and hire a bigger team of employees, all of whom can be leveled up and trained (at the expense of higher salaries) so as to create better games. If you really become a big company, and have employees with the right skill sets, you can even create your own console and compete with the well established big boys in the hardware game. To start off, though, you’re just a tiny company with a few employees and a small amount of start-up capital to work with. You can choose to make games for home consoles or PCs, but each console requires you to purchase a license before you can develop games for it. To earn some extra funding for licenses or projects, outside contract work can be accepted. It’s not the most exciting work, but it will pay the bills and help you earn enough money to make games of your own. Once you have the money to make a game, you’ll choose which platform, genre, and style of game you want to make. Your own employees can be used to create the story, graphics, and sound, or you can source out that work to other professionals for a fee. A number of factors can affect how your game sells, including your fan base, what time of year you release (holiday season is best), and how the media reviews the game. One aspect I especially liked about Game Dev Story is how it parodies every major console released for the last 20+ years, and loosely mimics their individual success levels. So when Intendro introduces the first portable game system the Game Kid, you can bet it will be a really popular system to support given the Game Boy’s history. However, when they come out with the newfangled Virtual Kid, with its headache-inducing 3D goggles, you’ll see it disappear from the market fairly quickly. These are the types of things that you must consider before shelling out the dough for a console license, although one extremely popular game can rewrite the history of a failed console as well. 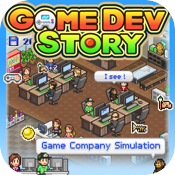 While the gameplay in Game Dev Story is fun and engaging, the overall presentation falls a bit flat. The 16-bit style pixel graphics are charming and certainly get the job done, but they are a far cry of what is capable from even the oldest iOS devices. The screen size is also oddly small, with plenty of wasted space on the top and bottom. It almost seems as if it’s a port from a different device, like an older smartphone or PDA, but I couldn’t find any information to that effect. The menu navigations work just fine and the game is still very easy to play, it just seems strange. Another minor annoyance is that despite having an in-game manual hardly any of the game mechanics are explained very well, although the game is simple enough that you catch on after playing for a bit. Game Dev Story won’t impress you with stellar visuals or an iPhone specific feature set, but it is a well thought out and thoroughly enjoyable time sink, and is even more intriguing if you’re familiar with the last few decades of video game history. It took me roughly five hours to play through the 20 year career of my company, and at the end of that time your highest selling game and biggest profits serve as the final score, though you can keep playing beyond that time period indefinitely if you choose. There really is just something about this game that keeps me coming back for more over and over again. 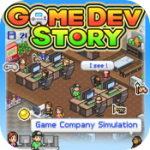 Further impressions and help discussion are taking place in our forums, and if you’ve ever had a hankering to create your own video games then Game Dev Story is one you should definitely check out.